Contact Author - Steve S. Ryan PhD. He is author of the book, 'Beat Your A-Fib: The Essential Guide to Finding Your Cure', and known as the A Fib Coach for his personal counseling of A-Fib patients seeking relief from the burden of Atrial Fibrillation. After struggling to find his own A-Fib cure in 1998, Dr. Ryan started the non-profit website, 'Atrial Fibrillation: Resources for Patients' (www.A Fib.com), now in its eleventh year. A-Fib.com is a source of well-researched, unbiased information on current and emerging treatments, resources and medical research―all written in plain language. Every month tens of thousands of A-Fib patients and their families visit A Fib.com seeking hope and guidance. Healthcare professionals around the world refer their patients to www.A-Fib.com. Dr. Ryan's book, 'Beat Your A-Fib: The Essential Guide to Finding Your Cure', has received over thirty 5-star customer reviews on Amazon.com. An eBook version of 'Beat Your A-Fib' is available from the author's book site: BeatYourA-Fib.com. Dr. Ryan earned a Ph.D. in Educational Communications from the Ohio State University, and for many years he taught college film and television courses. He and his wife, Patti, live in Malibu, California. 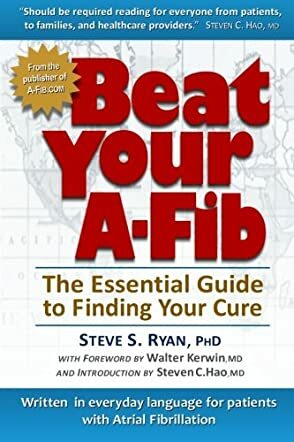 Beat Your A-Fib: The Essential Guide to Finding Your Cure by Dr. Steve S. Ryan, PhD, is a comprehensive guide for anyone in search of a cure for their atrial fibrillation, the most common heart rhythm disorder. As an individual that comes from a family with a history of atrial fibrillation, Beat Your A-Fib: The Essential Guide to Finding Your Cure instantly caught my attention. We have seen people’s life spiral downward, with varying degrees, because of A-Fib. I am surprised that the author, Dr. Steve S. Ryan, is a former patient of this heart rhythm problem himself. On the other hand, this revelation shows me how credible and helpful this book will be compared to other material about A-Fib. It's a readable and complete guide to the condition, thus laymen do not need to fear confusing medical jargon. It covers everything you need to know, if I may say, and even more so than the conventional medical system itself. Without degrading the importance about getting to know A-Fib, the causes, mineral deficiencies, and other topics in this book, I find the personal stories most encouraging and very helpful. All in all, patients of A-Fib and their families would definitely benefit from this priceless guide. They will learn that they have choices in terms of treatments; most importantly, they will realize that they do have control instead just of depending on their cardiologist one hundred percent. I highly recommend this insightful book to anyone who has to deal with A-Fib in their lives.